It's powerful and comfortable, but at $799 without the necessary accessories it's a tough sell. What if HTC could make the Vive VR headset again, but with better ergonomics, and higher quality screens? That's basically the Vive Pro. It's not a sequel -- it's more of a remaster. 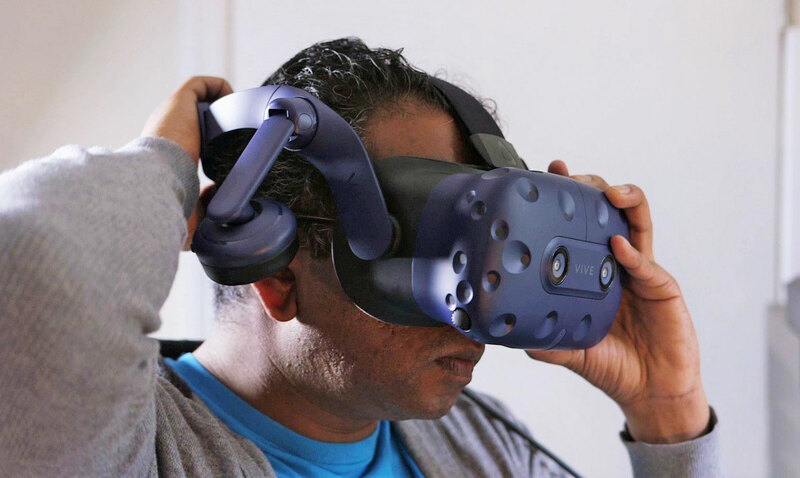 One that incorporates everything VR headset makers have learned over the past few years. (Spoiler: Comfort matters. A lot.) At $799 with no sensors or controllers, though, it's strictly for enthusiasts and professionals with plenty of disposable income. The Vive Pro has everything we wanted in HTC’s original VR headset. But it’s incredibly expensive, especially if you need to buy new accessories. At this point, it’s clearly only meant for VR professionals. Be the first to review the Vive Pro? The first thing you'll notice with the Vive Pro is that it's a deep blue instead of the original's all-black design. While that's helpful for distinguishing the two, aesthetically the blue shade doesn't add much. The headset looks much larger, but paradoxically, it's also significantly lighter. Its plastic case and humdrum design don't really distinguish it from other VR headsets, but current Vive users will notice the differences. Instead of a constant work in progress, this new headset feels like a finished product. Most important, there's a new head-strap system. It's similar to the Deluxe Audio accessory HTC released a year after the Vive's debut, which added headphones and replaced the original head straps. While this new system looks a bit complex at first and makes the headset much longer than before, it's straightforward. You simply place the eyepiece over your face, rest the back strap against your head and rotate the dial to straighten it. There's an adjustable band at the top, but that's something you only have to deal with the first time you put it on. 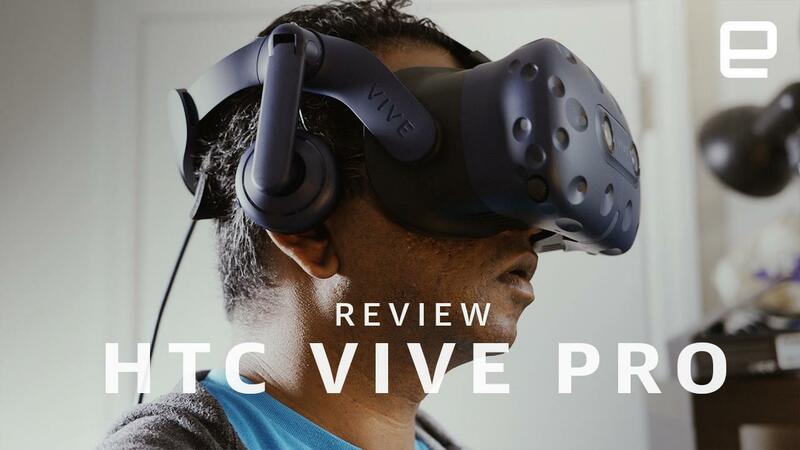 It's a huge improvement over what HTC launched with two years ago, which involved using three separate velcro straps to secure the Vive to your head. That was functional but incredibly clunky. And coupled with the additional weight of the original headset, tough to wear comfortably for extended periods. 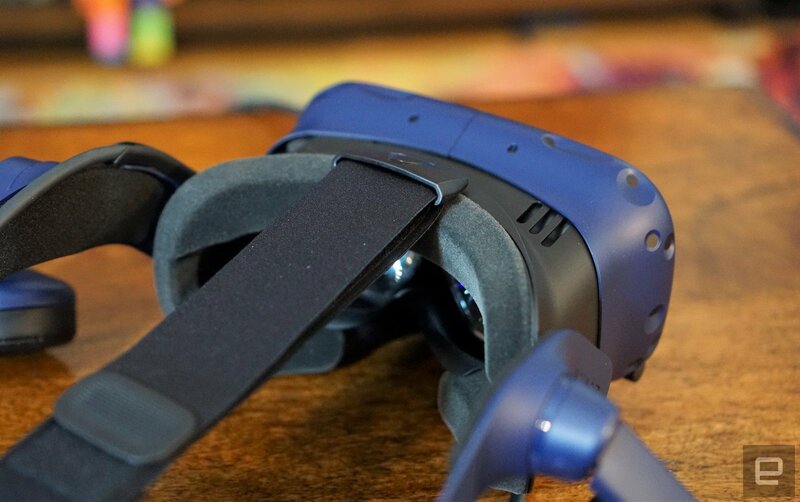 The Vive Pro, on the other hand, balances the weight of the headset well, similar to Sony's PlayStation VR. Its built-in headphones are also hard to miss. They have a generous amount of padding and can be adjusted easily. While they may make the headset look a bit overstuffed, they're far more convenient than the earbuds on the Vive, which was just another wire to deal with. And they're certainly better than trying to juggle larger headphones with an already oversize VR headset. Audio purists might disagree (we get it, you really like your Grados), but a built-in design makes more sense for VR. Both the Oculus Rift and Samsung's HMD Odyssey make it clear that's a far better option for maintaining immersion and presence, which should be the primary goal for every headset. The Vive Pro also has significantly more plush cushioning around its entire faceplate, and even more at the back of the head strap. It made a huge difference after several hours of testing -- my forehead was still a bit sweaty, but I wasn't left with any lasting pain around my face. It also feels easier to clean than before, and as always, you can replace it when it wears out. The Vive, meanwhile, just had some basic foam face protection, which was harder to maintain and tougher to wear. It might seem like a trivial difference, but it's important given just how much skin contact VR headsets make. Aside from headphones, that's not something we worry about with most gadgets. I haven't even gotten to the biggest technical upgrade yet: the higher-resolution screens. The Vive Pro's OLED displays run at 1,440 by 1,600 pixels per eye -- that's a 78 percent higher resolution the original Vive. It keeps the same 110-degree field of view, though. That's standard for high-end VR headsets like the Oculus Rift and Samsung HMD Odyssey, but it would have been nice to see HTC push things forward a bit. The huge Star VR headset boasts a 210-degree FOV, for example. Because the Vive Pro is being sold as a standalone headset, you'll have to buy two of HTC's Lighthouse sensors and VR controllers separately. HTC is offering all of those accessories together in a $299 bundle (which is $231 less than buying them all individually), but that's still a significant expense on top of the Vive Pro's $799 price tag. If you've already got that equipment, then setting up the Vive Pro is as simple as connecting its breakout box to your computer's USB 3.0 and DisplayPort connections, and then plugging in in the headset itself. If you're doing it for the first time, though, you'll have to find space at two opposing corners of your room to mount the Lighthouse sensors. I was able to make do with placing them on my bookshelves, but if don't have something like that around, you might have to mount the sensors on your walls. It's also a shame that HTC's SteamVR 2.0 sensors won't be available until the end of the year because those will be able to track your movement in much larger spaces. But I suppose that won't be very useful until we see the Vive's wireless adapter, which is coming this summer. The first time I used the Vive Pro, it took me a few minutes to figure out how to adjust its new head strap properly. Once I got that sorted, I noticed instantly that it fit much more securely (and more comfortably) than the original. It's not as front-heavy as the Vive, which would hurt the bridge of my nose when I wore it too long. It's more like the PlayStation VR -- a large headset that's still comfortable to wear thanks to some smart ergonomics. As you'd expect, the Vive Pro's improved screens made just about everything look better, from text in Viveport to enemies in Superhot. While playing Duck Season, I was able to make out where my distant targets were more easily. And flying around the globe in Google Earth VR felt even more immersive than before. But while the experience is better than the original, it's not exactly a night and day -- it's certainly not enough to justify upgrading to a pricey new VR headset if you already have one. You'll also have to make sure you have a computer that can run the Vive Pro at its best. HTC says it has the same minimum system requirements as the Vive -- an Intel Core i5-4590 CPU or better, and at least an NVIDIA GTX 1060 card or an AMD Radeon RX480. But at CES, the company also admitted that you'd need faster hardware to take advantage of the better visuals. That's not surprising, but it's something to keep in mind if your system can barely run the Vive already. On my recently refreshed rig, which is powered by an Intel Core i7-8700K CPU and a GTX 1080, I didn't notice any hiccups or slowdown across a wide variety of VR titles. But, that's the same video card HTC was using at CES, so it's a safe bet for optimal Vive Pro performance. While I appreciated the slightly better visuals, it still felt a bit archaic to be using my original Vive controllers with a new headset. They're larger and heavier than Oculus's excellent Touch Controllers, which were released in 2016. Valve has its own modernized VR controllers coming for SteamVR, which are significantly smaller and offer individual-finger tracking, but there's no word on availability. There are a lot of downsides to jumping on the Vive Pro bandwagon early, as you'll likely be tempted to replace your controllers and trackers later this year. At $799 on its own, the Vive Pro is a great deal more expensive than the standard $499 Vive kit, which includes the original headset, two base stations and two motion controllers. Normally you'd have to spend another $530 to snag all of those, but HTC is now offering a $299 bundle to make life a bit easier for new users. Still, that means a complete Vive Pro setup will cost $1,098. If that sounds crazy well ... it is. Of course, the Oculus Rift is still a solid competitor, especially because it's now just $399 with all of its sensors and is bundled with superior controllers. At that price, the lower resolution doesn't really seem like a huge deal. Windows mixed reality headsets are another option, especially Samsung's $499 HMD Odyssey, which almost matches the Vive Pro's resolution and has great motion controllers. Another plus with mixed reality headsets, they don't require setting up any annoying sensors. And they support SteamVR, giving you access to the same games and apps as the Vive. I give HTC some credit for fixing most of the problems I had with the original Vive. But at the moment, the Vive Pro isn't a must-have upgrade, especially without its accessories. 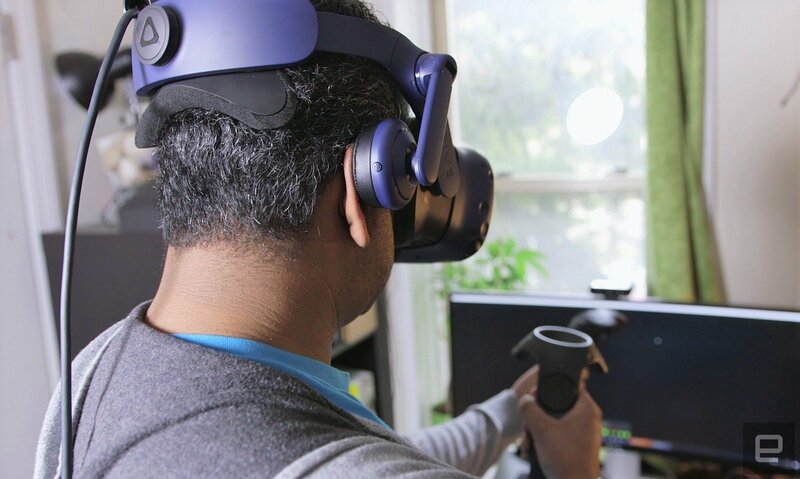 Its expensive pricing cements the fact that this isn't a headset meant for most people -- it's really something for VR developers and designers who want the best hardware on the market right away.